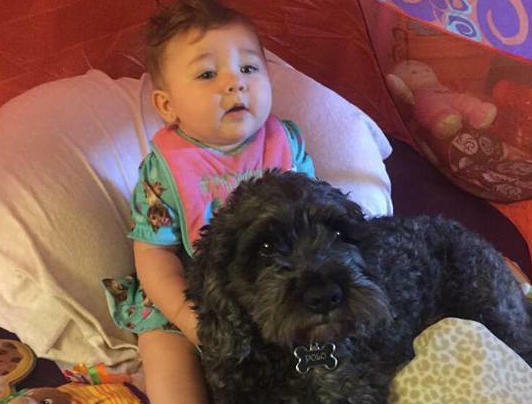 The lives of a Baltimore family were changed forever this week when a fire suddenly broke out in the home Erika Poremski shared with her eight-month-old daughter, Viviana, and her nearly six-year-old dog, Polo. Poremski says she had just stepped out to her car when she turned around and discovered her house in flames with Viviana and Polo still inside. Poremski suffered burns on her hands and face from the various attempts to get into the house and rescue Viviana. With Poremski unable to get back inside and firefighters still on their way, Polo bravely remained upstairs in the bedroom where Viviana was crying. Poremski believes that he could have run downstairs and out the door to safety, but chose instead to shield baby Viviana from the flames with his body. That close bond may explain why the beloved canine made the ultimate sacrifice to protect the baby. And while Polo did not survive the blaze, Viviana is likely alive today because the dog remained with her. When firefighters finally arrived and got to little Viv, Poremski says they discovered the dog still covering her with his body, and Viv only suffered burns on her arm and side because of it. Paramedics were reportedly able to revive her at the scene. Oddly enough, Poremski believes that her beloved pup had a sense of what was coming. With the family now displaced and Viviana’s condition still serious, a GoFundMe campaign has been set up to help pay for the little girl’s medical bills. To date, the page has raised nearly $17,000... money that will certainly help heal the family’s financial wounds. Their emotional wounds, however, will take more time.